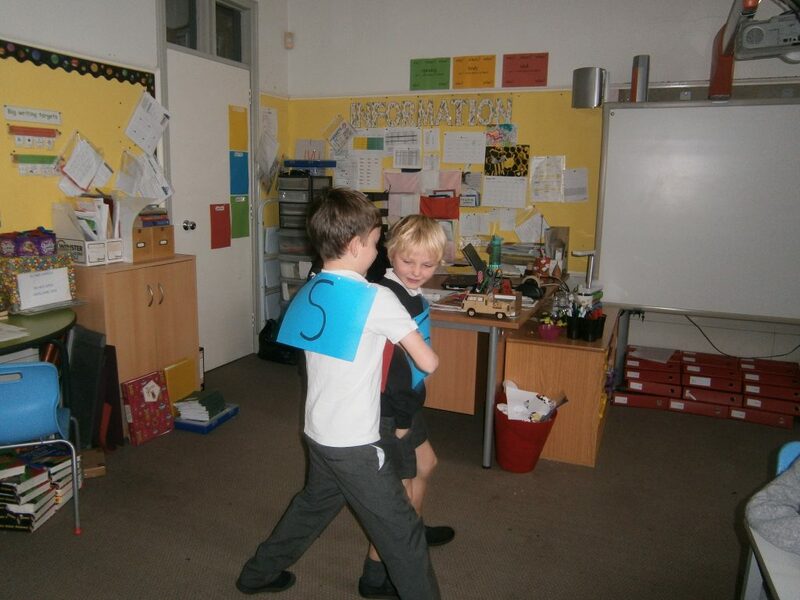 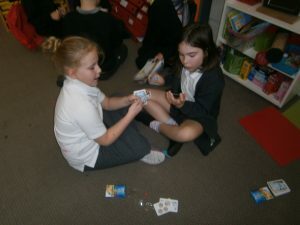 We have had another busy week in P3. 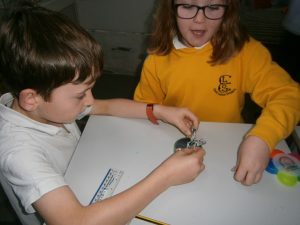 We have been learning how to read clocks but have tried a new teaching method using only one hand to read o’clock and half past times, so far it seems to be working. 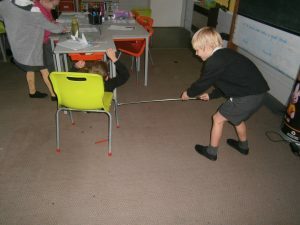 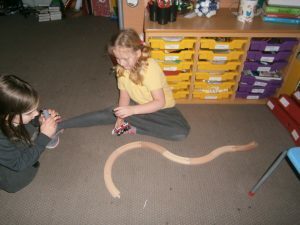 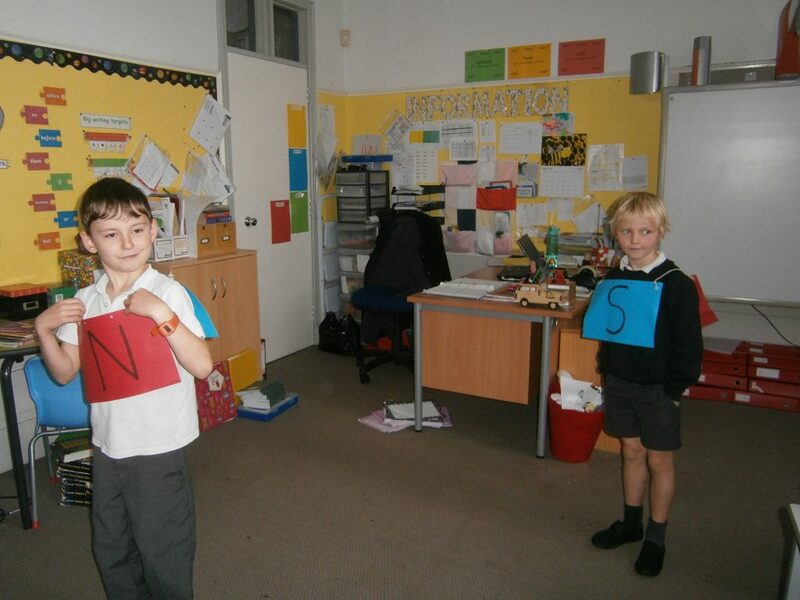 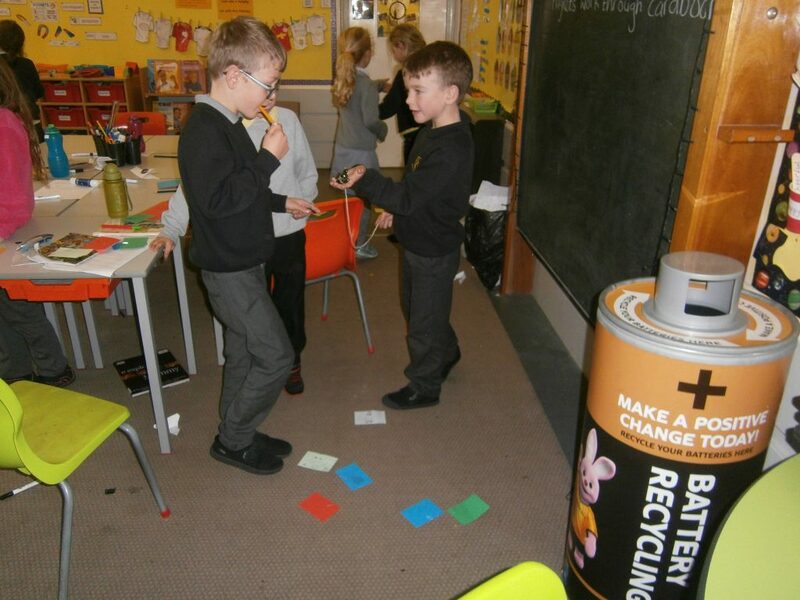 We have done a lot of work on our magnets project, we have been learning some of the words related to magnets such as repel and attract and we investigated how the force felt with bar magnets and human magnets. 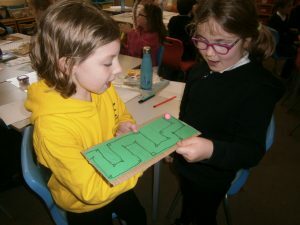 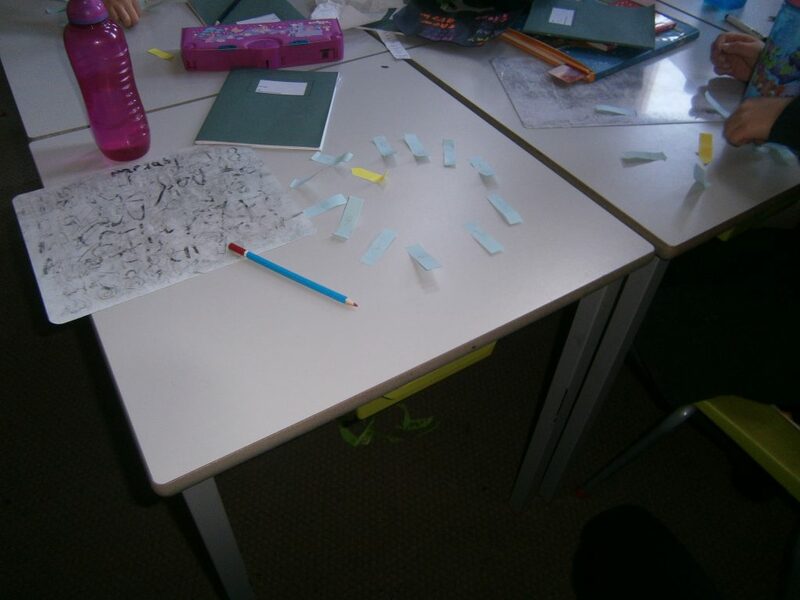 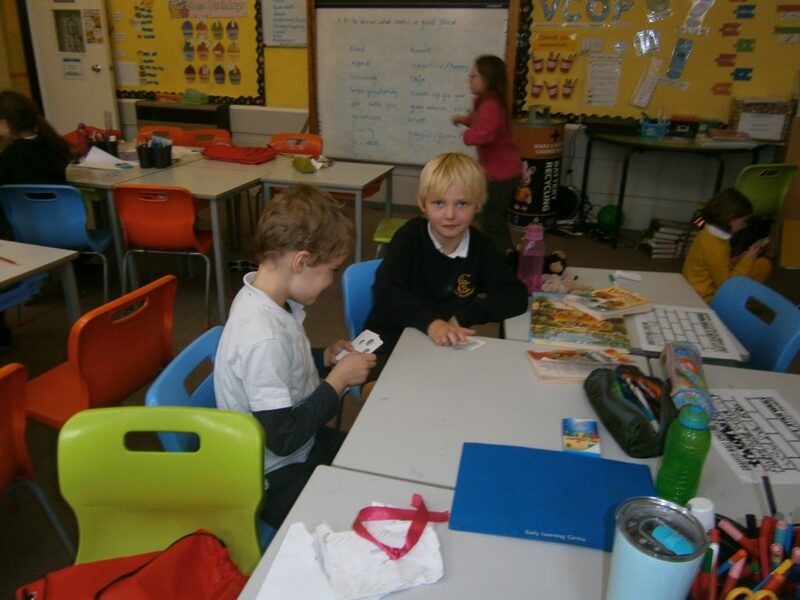 We have also been experimenting with magnets in the classroom and have made games to discover if magnetism can travel through non-magnetic materials. 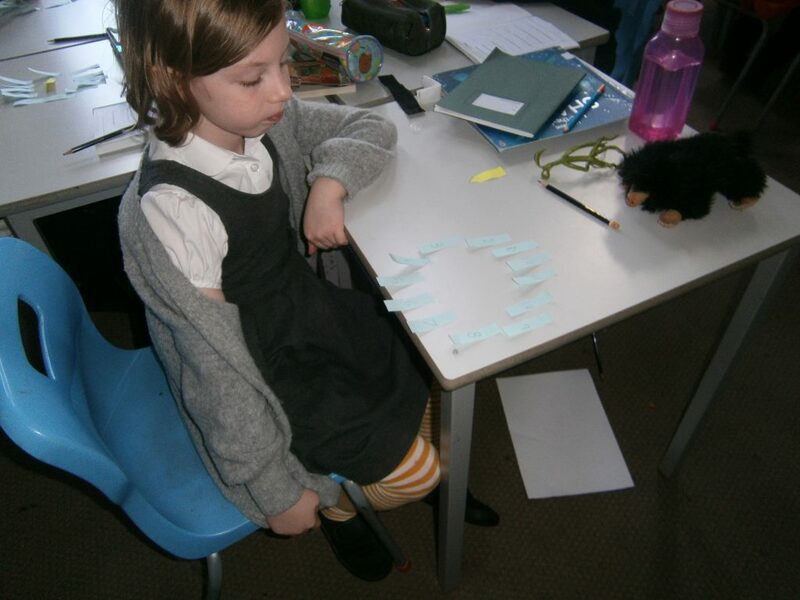 We made mazes and a fishing game with our spelling words. 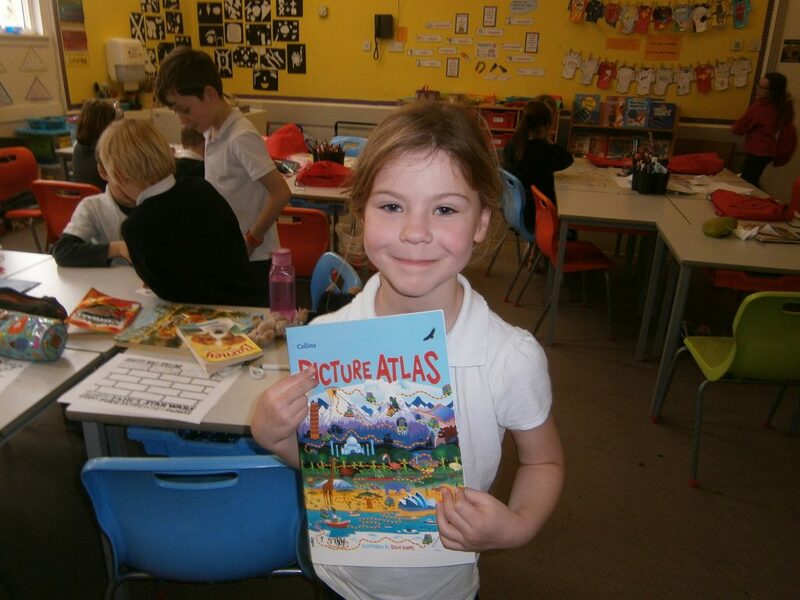 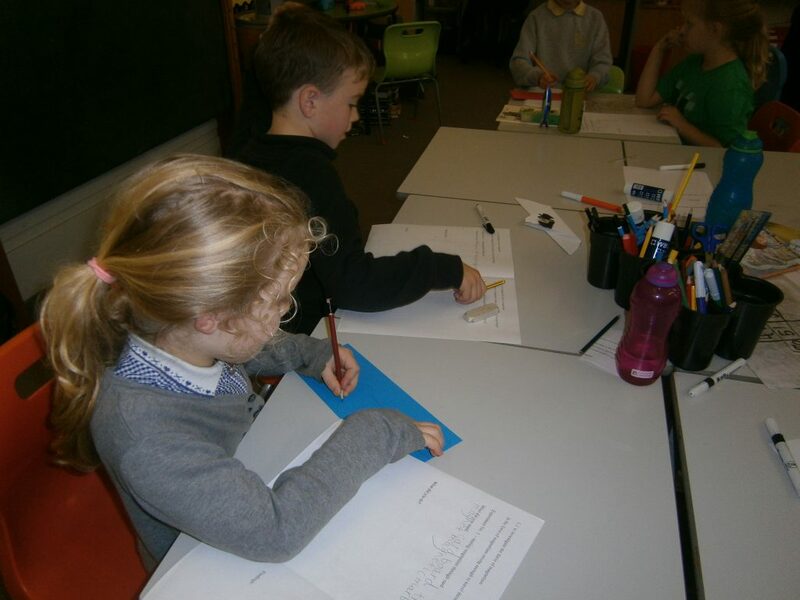 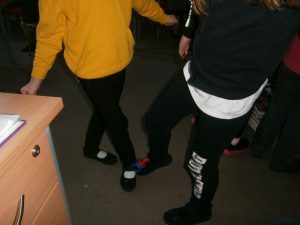 As it was Book Week Scotland this week we had a visit to the library on Monday, we heard the story of Thistle Street and learnt some Scottish words. 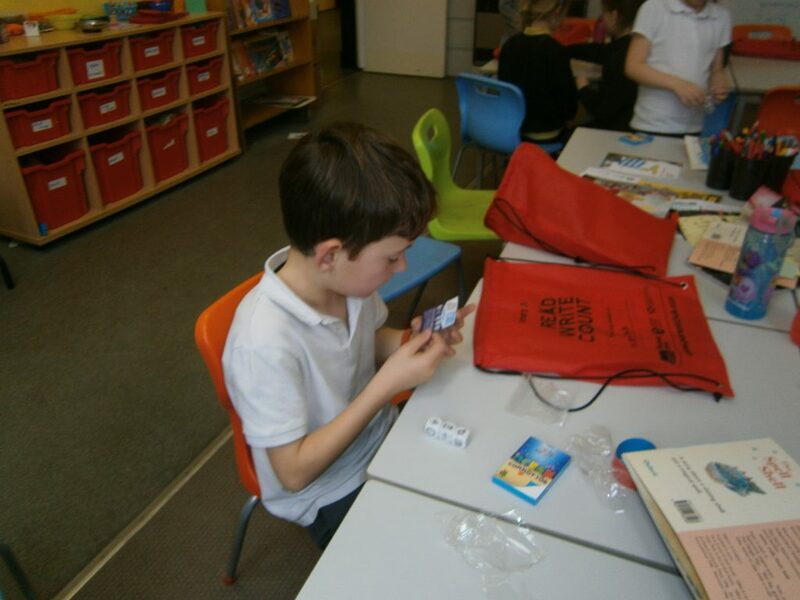 All of us received a Read, Write, Count bag full of lovely items for us to take home, there are two lovely books, card games, story dice and a notebook and pencil. We had a visit to the Playpod with P5 and had great fun using all the new equipment in very creative and imaginative ways. 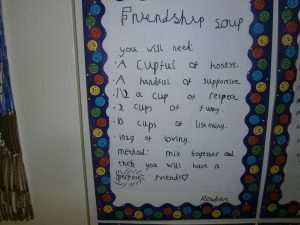 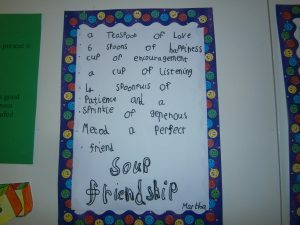 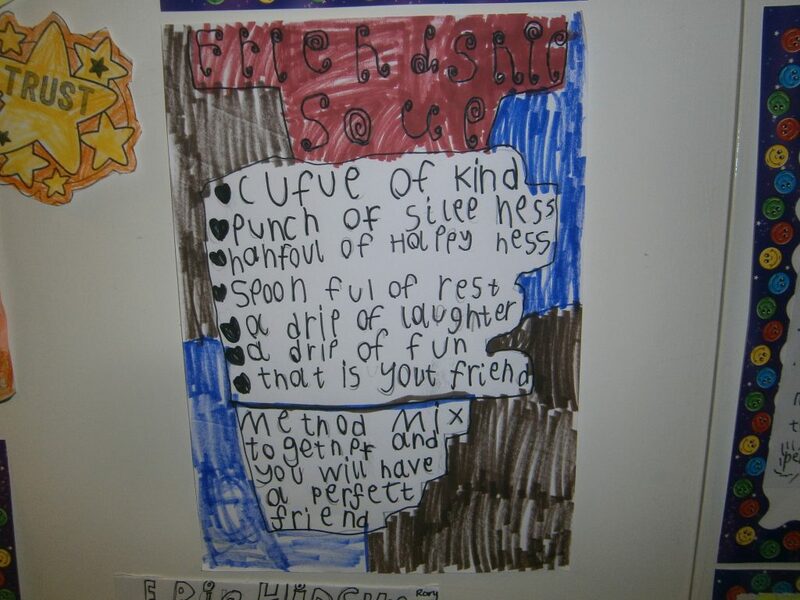 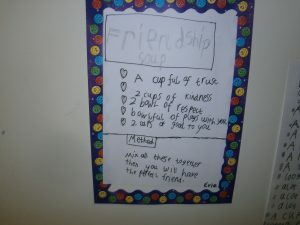 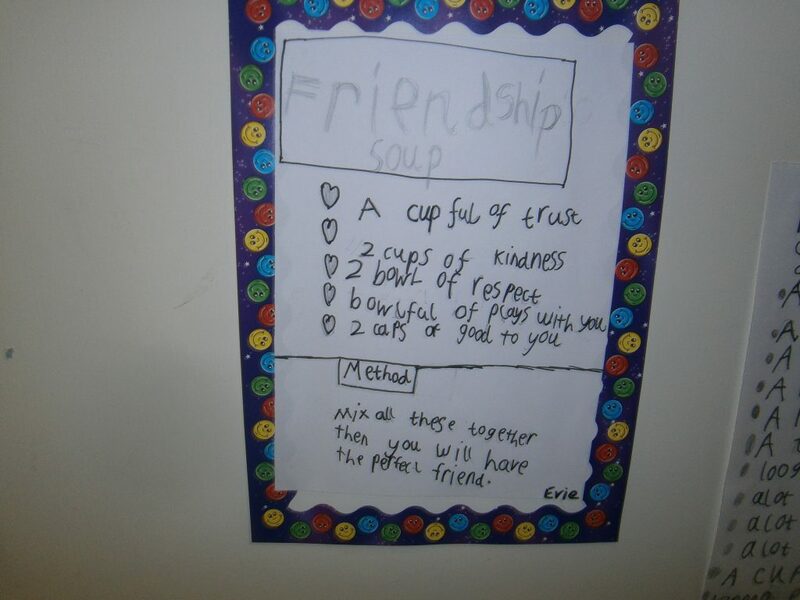 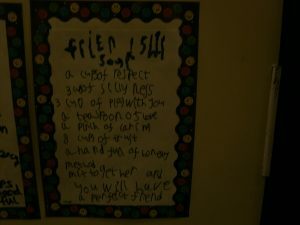 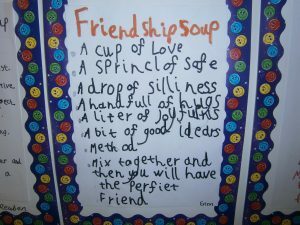 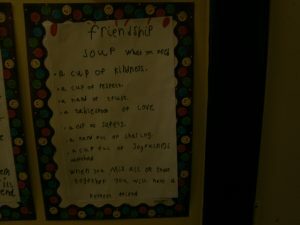 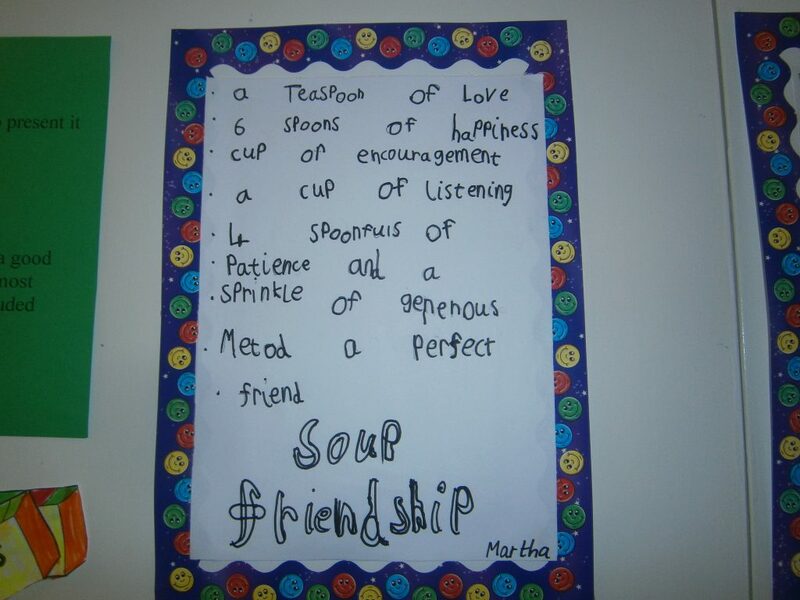 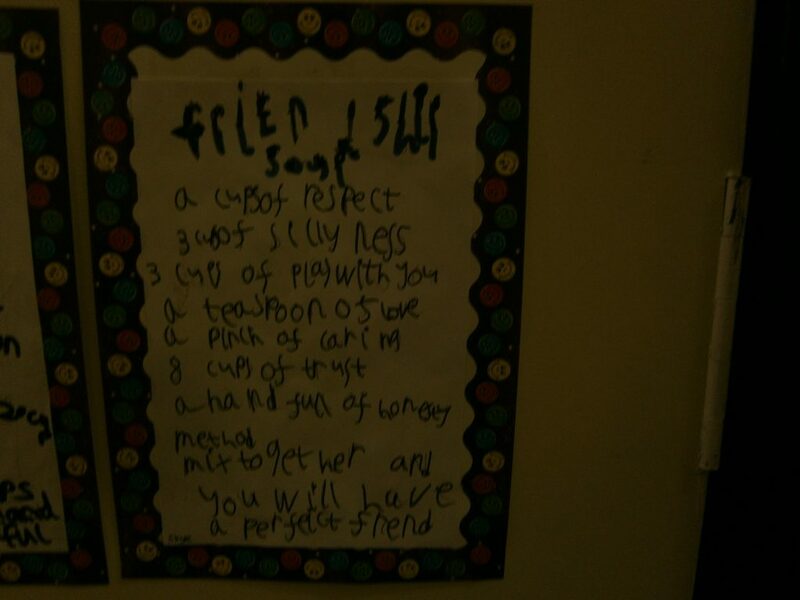 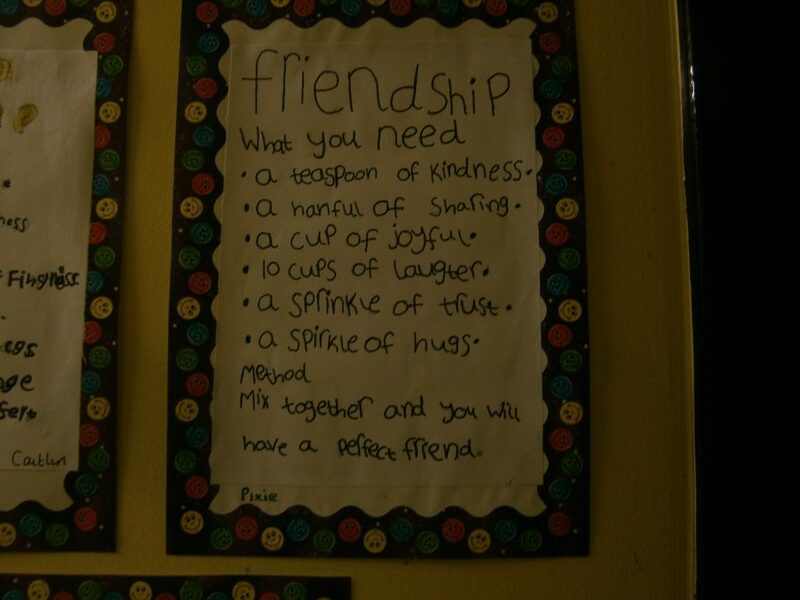 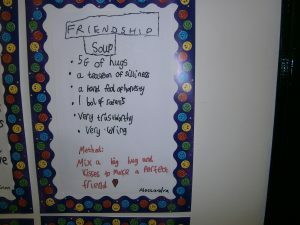 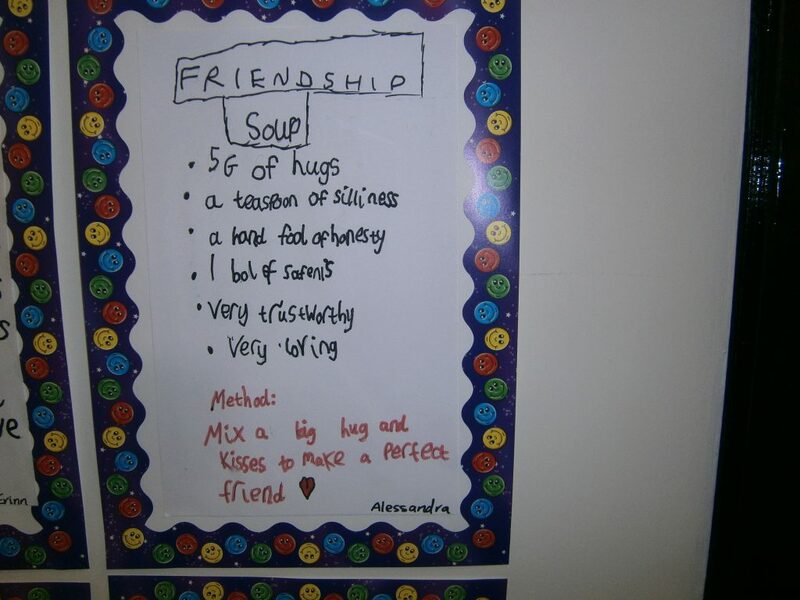 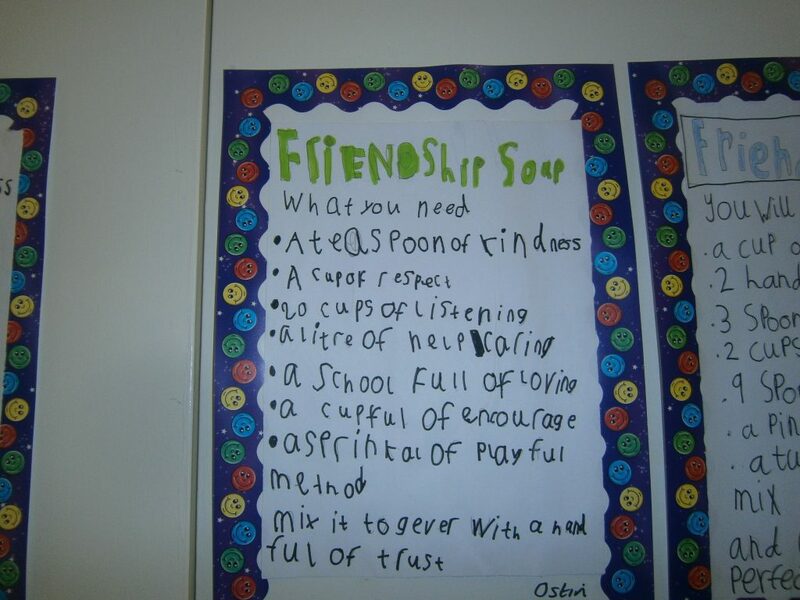 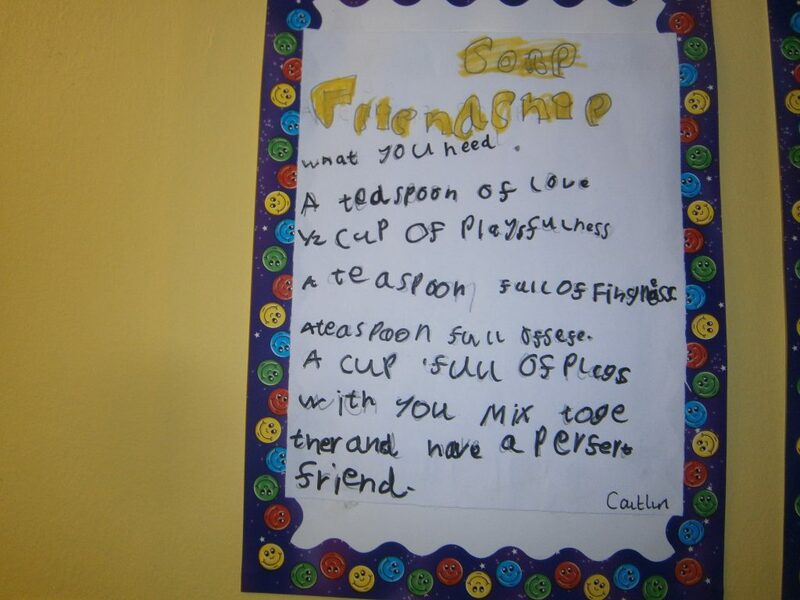 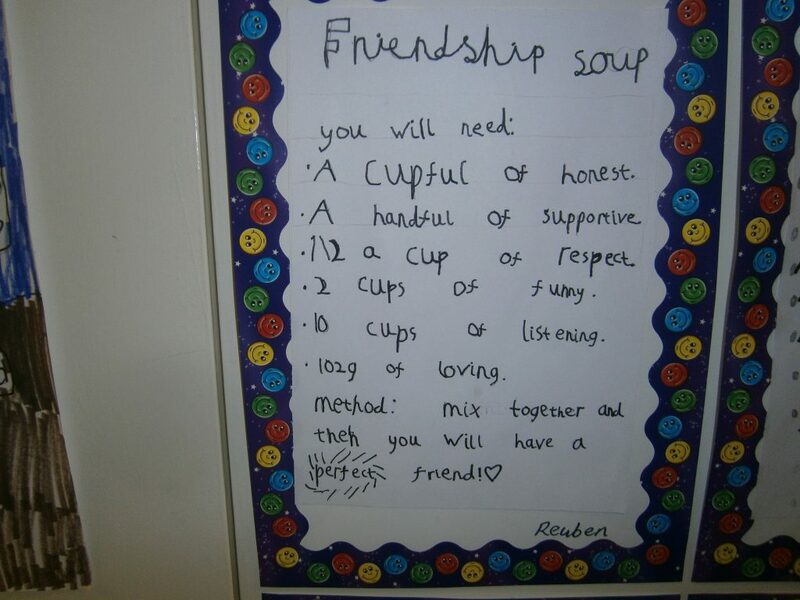 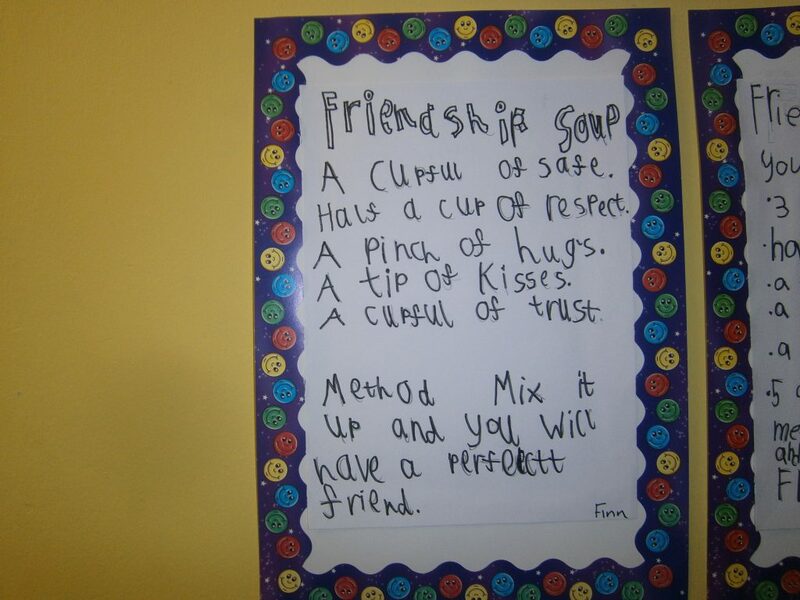 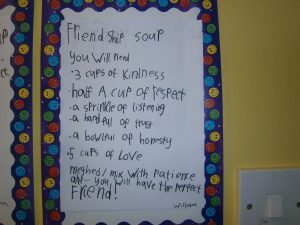 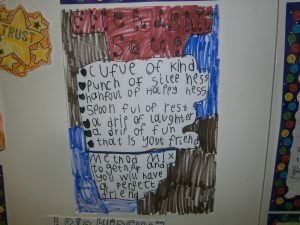 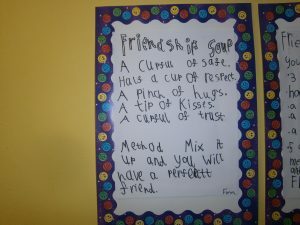 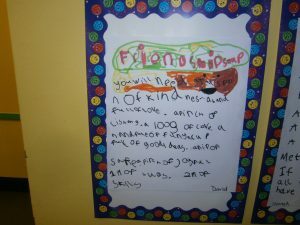 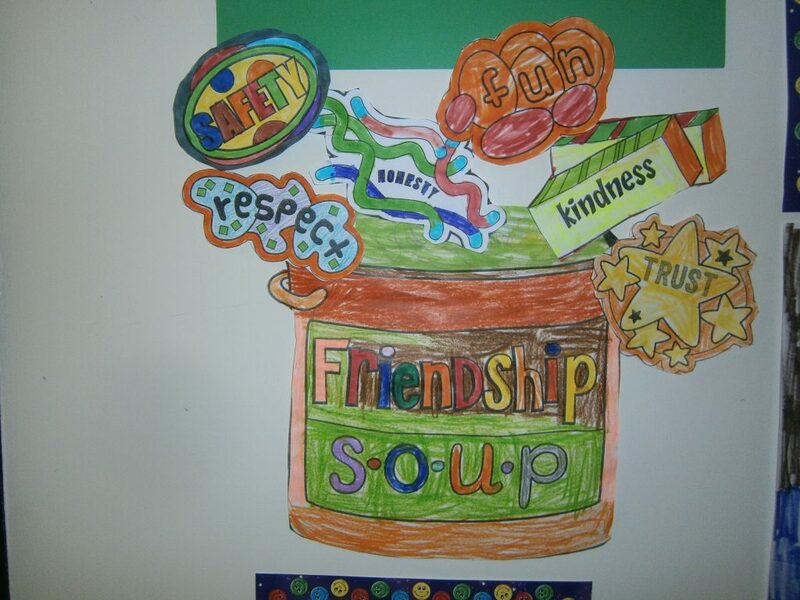 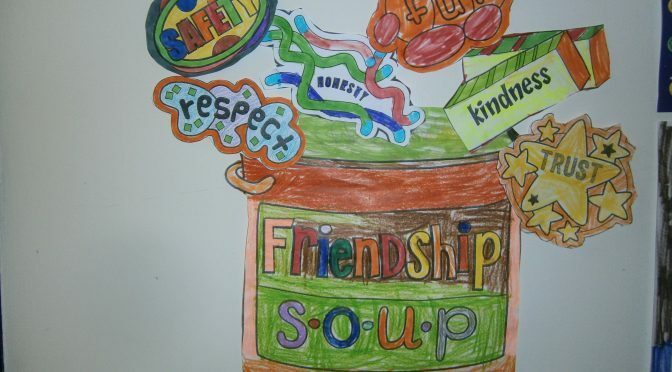 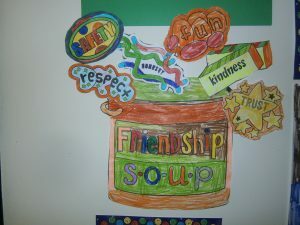 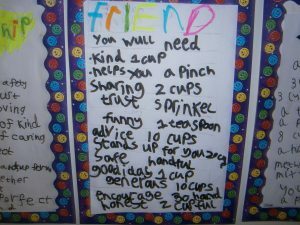 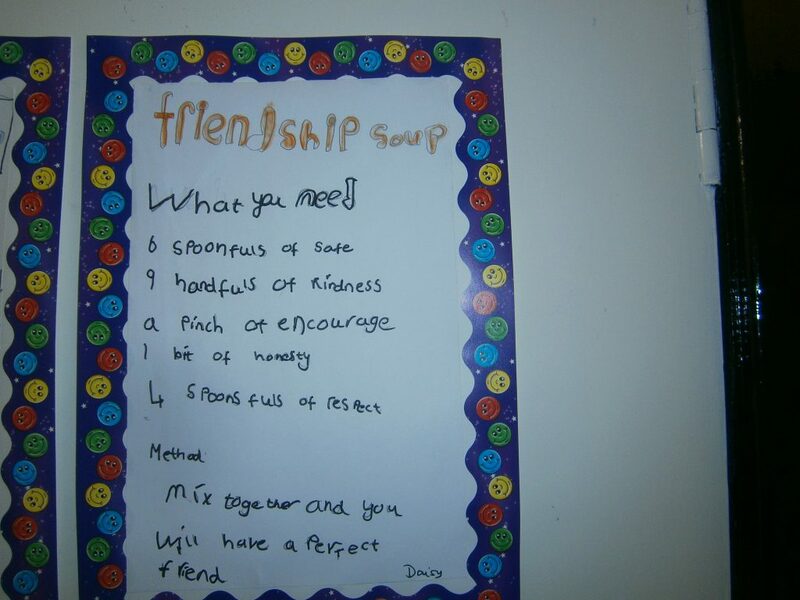 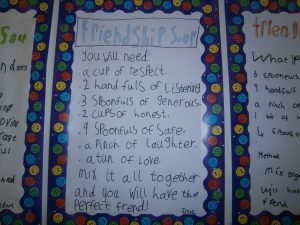 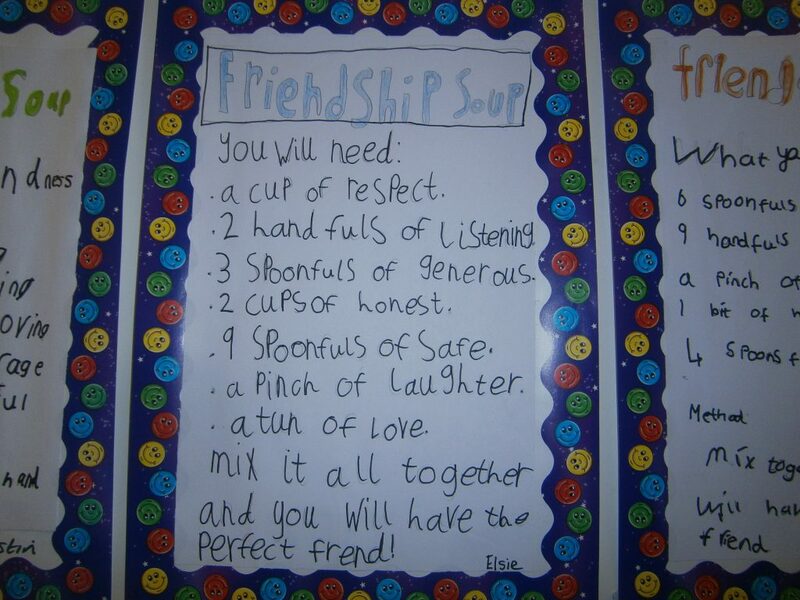 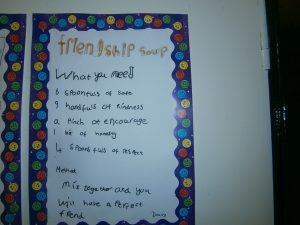 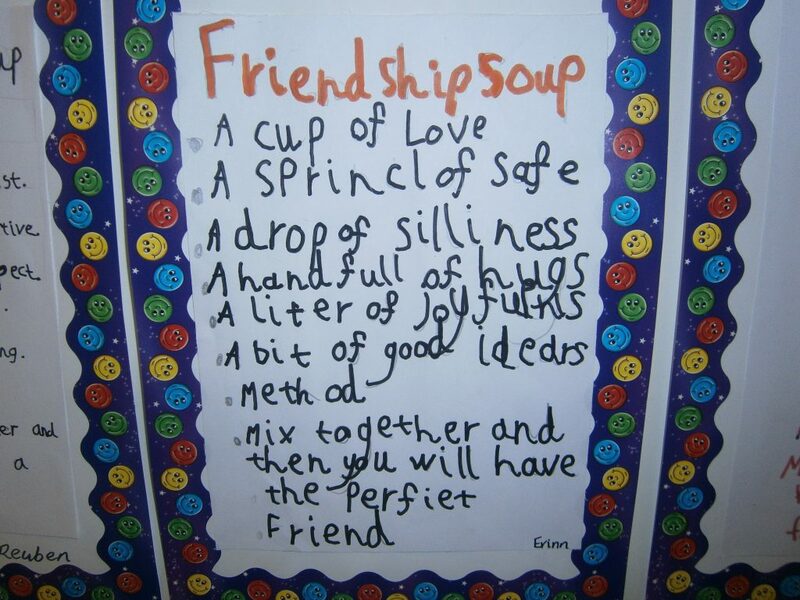 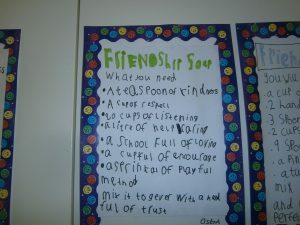 Finally our writing this week followed on from our Friendship wreath last week, we wrote recipes for friendship soup. 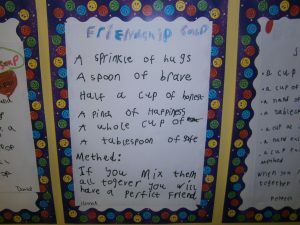 We had to decide which qualities we thought should go into our friendship soup recipe and how much of each ingredient, we then came up with a method to make our friendship soup. 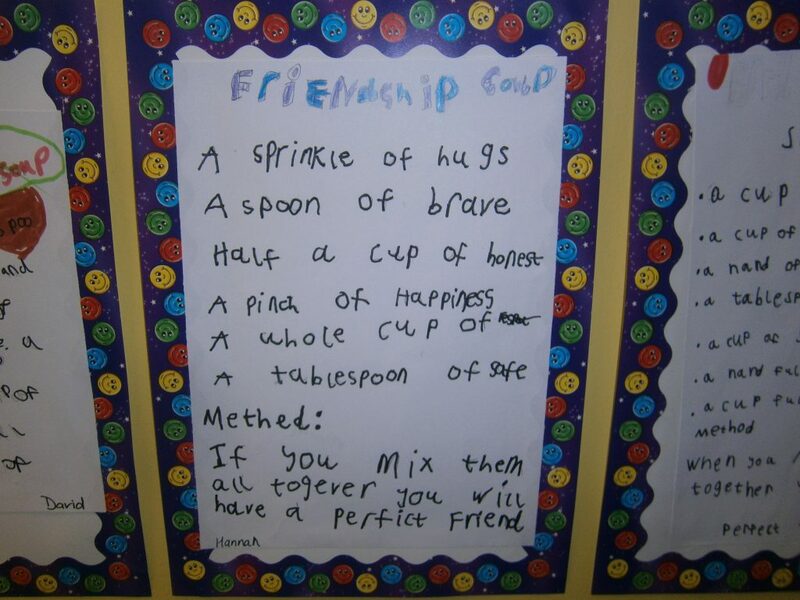 We wrote our recipes out and made them look wonderful so they could go on display. 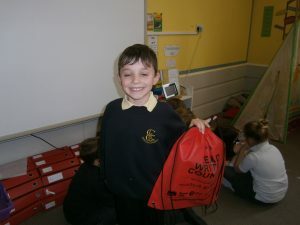 Really cool to read about last week. 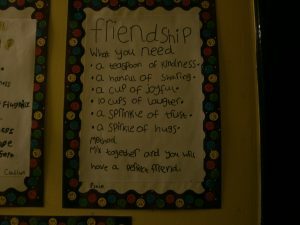 Finn and I just looked through the photos and chatted about the magnets and friendship. 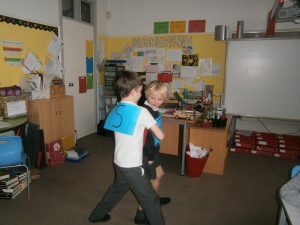 I love the practical magnet learning style with Finn and Jake bouncing off each other when they had the same polarity! 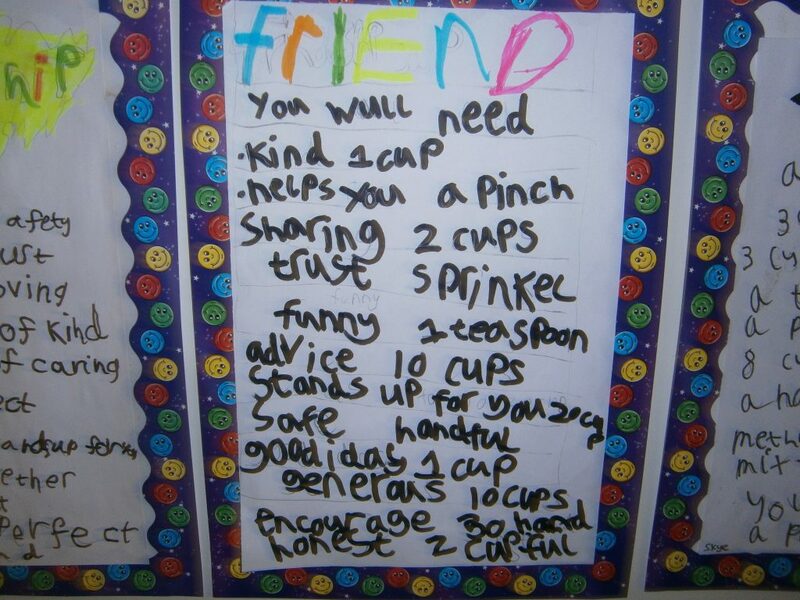 Thanks Donna. A super update, and it’s so great to hear that P3 got to use the playpod last week! 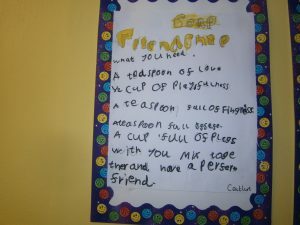 Many thanks for all of the pics of the kids’ work, they are beautiful recipes that the kids have created.